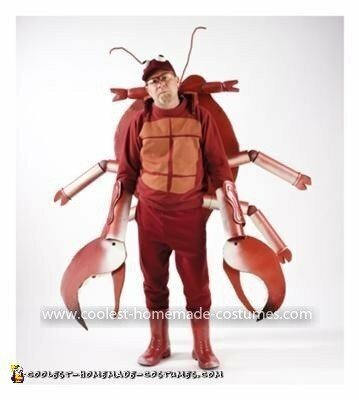 I came up with this idea for a Homemade Deadliest Catch aka Crab Man Costume while eating Pringles. It was made using 100% recycled materials. The arms are made with 8 Pringle cans joined by 8 bungee cords and 4 tennis balls. I drilled a hole in the metal bottoms and indented the cans where they meet each other. Each arms left side is joined to its right side with bungees and “S” hooks. This makes them bounce and gives the costume a life like presentation as well as staying durable and flexible when bumping into people and walls, etc. The small hands are joined using small ziplock containers. They fit perfect into the Pringle cans tops. The body is 1″ cardboard which I used a hand held jigsaw to cut the body, claws and a back-pack like support. My eyes are rubber door stops painted like eyes. The antennas are made using lead wire and red beads. The claw arms are made using cardboard tubing and soccer shin guards. The teeth of the claws are made with white play-do. The sweatshirt I masked off with frog tape and used fabric paint to make a chest plate. 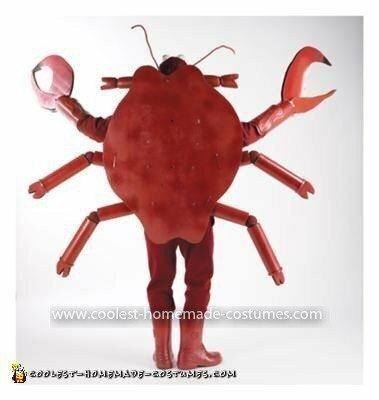 The boots and entire crab was hand painted using spray paint … a few nuts, bolts and zip ties along with some hot glueI try to dress up every year and surprise the neighborhood kids, since my wife and I never had any of our own. This year I chose to be “Crabman” with the Deadliest Catch as my theme. 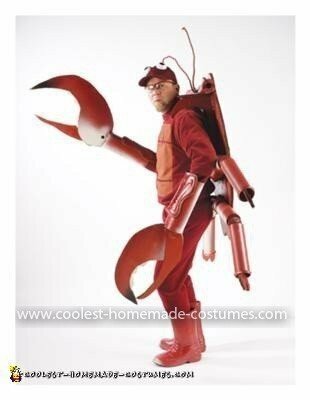 I came up with this idea for a Homemade Deadliest Catch aka Crab Man Costume while eating Pringles. It was made using 100% recycled materials. The arms are made with 8 Pringle cans joined by 8 bungee cords and 4 tennis balls. I drilled a hole in the metal bottoms and indented the cans where they meet each other. Each arms left side is joined to its right side with bungees and “S” hooks. This makes them bounce and gives the costume a life like presentation as well as staying durable and flexible when bumping into people and walls, etc. The small hands are joined using small ziplock containers. They fit perfect into the Pringle cans tops. The body is 1″ cardboard which I used a hand held jigsaw to cut the body, claws and a back-pack like support. My eyes are rubber door stops painted like eyes. The antennas are made using lead wire and red beads. The claw arms are made using cardboard tubing and soccer shin guards. The teeth of the claws are made with white play-do. The sweatshirt I masked off with frog tape and used fabric paint to make a chest plate. The boots and entire crab was hand painted using spray paint. A few nuts, bolts and zip ties along with some hot glue were added to assemble and support the costume. As I mentioned almost all the costume is made with recycled material and cost very little to make… The spray paint was the most expensive part of the costume. In total no more than $60.00. During Trick-or-Treating, we handed out Captain Sig Hansen Topps Baseball Cards with our candy. This was to help expose the children in the neighborhood to Fishing and Collecting as well as the Deadliest Catch and Discovery Channel. I Fish and Crab all year round and enjoy sharing my catch and fishing stories with friends. I won 1st Place ($200) for most Original Costume at Barleys Tap Room in Greenville, SC and 1st Place in a online competition for a Cajun Crawfish Company (got a FREE turducken). The costume received tons of complements everywhere I wore it! 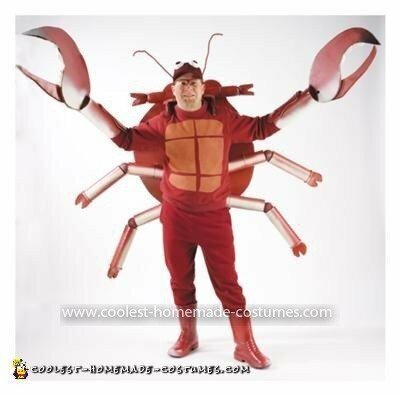 I had two people ask If I would be interested in showing up as a mascot for a crab festival and crab boil this year. The costume held up very well and could be used again next year. I had so much fun making and wearing the costume… even at 45 years of age! That is really good! Very Very creative! Thanks for your consideration. This is a nice job well done.